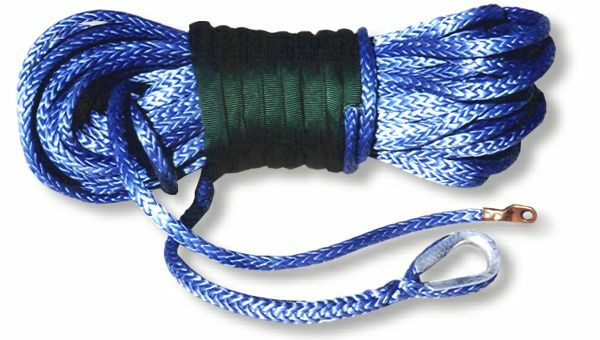 AmSteel Blue is the latest development of HMPE fiber in a twelve-strand braided rope utilizing Parallay design with proprietary blue urethane coating. U.S. Made Amsteel Blue synthetic fiber rope has a higher breaking strength than that of steel cable of the same diameter, but weighs less than 1/6. It won’t get all wound-up like cable, and can’t develop sharp frays. It doesn’t conduct electricity or heat, so it won’t freeze your hands in winter (excellent for plowing). It won’t rust, doesn’t kink, doesn’t recoil, doesn’t stretch, or doesn’t store energy. Need we say more! Lock-stitched Class II splicing, with heat-shrink. One 5′ abrasion guard included. Guard is flexible and compact enough to wind in with the rope. Comes right back out when you unspool. Comes in 4 Colors. Black, Red, Hunter Green, or Original Blue.